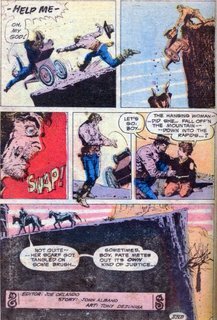 Weird Western Tales #31 "Gunfight at Wolverine"
This issue opens in June, 1875 (same year as last issue in Richmond, VA) with Jonah hex riding into Wolverine, Wyoming. As he rides past a large outdoor arena being built, he wonders why he friend Dave Prentice sent a telegram requesting Jonah come to Wolverine. Jonah & Dave fought together at Antietam and Dave is one of the fastest draws that Jonah as ever seen. Jonah arrives in town and wonders who he should ask to locate Dave. He is riding past the sheriff’s office as six men stand outside, calling the sheriff out. Jonah notes that 6 vs 1 doesn't seem fair but he's not gonna get involved. Just then the sheriff comes out & it's Dave. Dave strolls slowly out and asks the men which one wants to be the first to get his head blown off. They laugh, pointing out that it's six to one. Jonah corrects them, saying it's six to two (and adds ",Skunk" for an extra measure). The next scene is nicely written as Jonah & Dave discuss the telegram, the trouble Dave is in, how Dave will be with Jonah just as soon as he kills these men, Jonah taking note that one of them MIGHT get off a lucky shot, Dave letting Jonah taking first pick of which ones he wants to kill, and Jonah choosing "Big-Mouth over thar, an' Paul Bunyan over thar, an thet tall, ugly one over thar". The six men get pretty disgusted asking if they're gonna fight or stand there and talk everybody to death! Dave & Jonah draw, six shots are fired and the six men fall dead in the street. Dave compliments Jonah on his shooting and says that he wouldn't want to face-off against Jonah anytime soon. 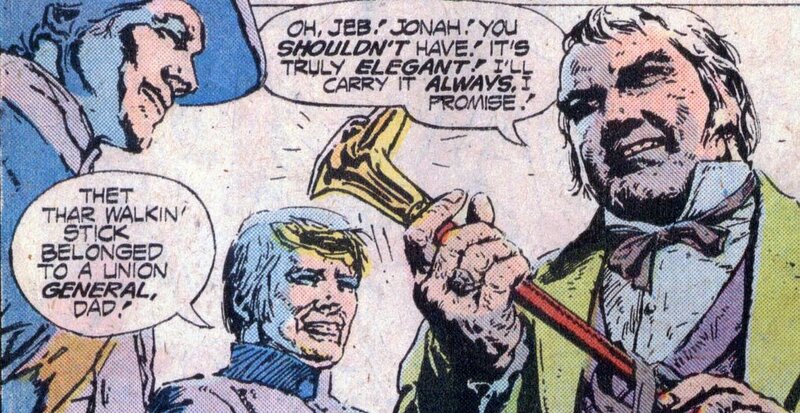 Jonah echoes the same sentiment regarding Dave. 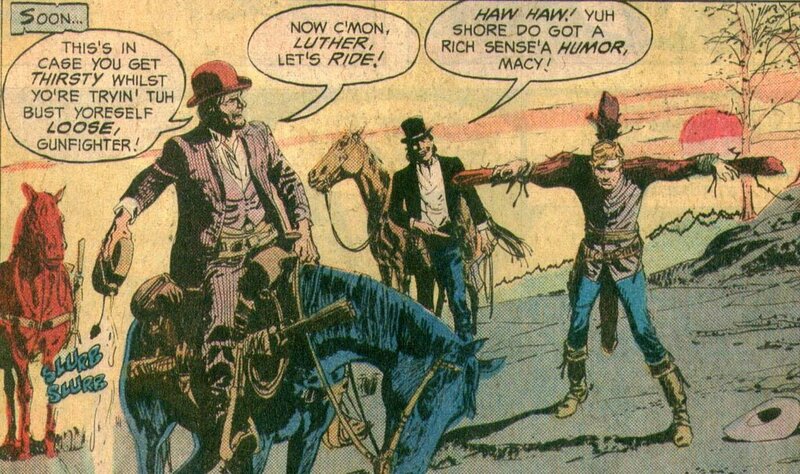 As Jonah & Dave go to the livery to get Dave's horse, Dave explains that those men were part of Butch McCandless's gang. They've been trying to get revenge since Dave hung a couple of his boys for bank robbery. As they ride out to Dave's place to meet his wife & son, they catch up on the past 10 years. Jonah makes mention of the ongoing cough that Dave has to which Dave responds it's from smoking and not to worry. Jonah asks why Dave sent for him & Dave says that he just wanted to see an old friend. As they pass the arena, Jonah asks why it's being built since it looks big enough to hold the whole town. Dave explains it's for a rodeo. When they get to Dave's house, he introduces his wife, Sandy, and son, Tommy. When Dave introduces Jonah, Sandy suddenly starts crying and runs inside. Later, during dinner, Sandy apologizes for her behavior. Just then a Molotov cocktail crashes through the window, setting the house afire. Dave tells Tommy & Sandy to put out the flames while he and Jonah sneak down through a tunnel Dave dug in case of Indian attack. Outside, two men have a string of bottles of kerosene, ready to throw at the house. As they ready to throw one on the roof, a bullet shatters the bottle and then all the other bottles, except two are shot as well. We hear Dave compliment Jonah on his shooting and says that he'll shoot the last two bottles. 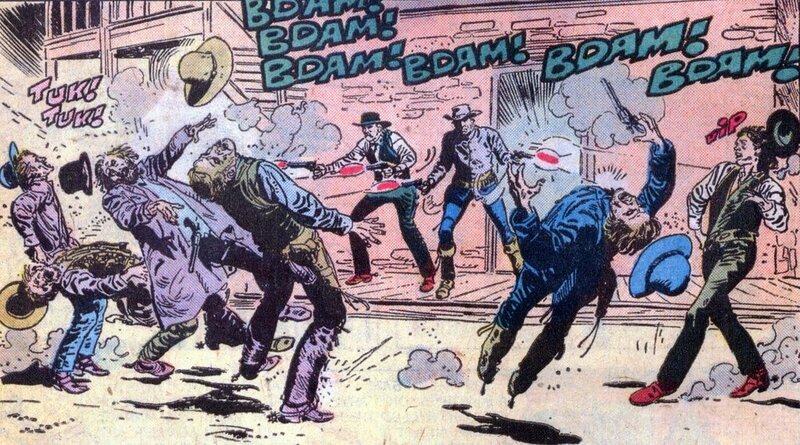 The two fire-bombers draw their pistols and are gunned down. Jonah notes that Dave missed the bottles. Dave spots two more men over by a hay bale. Jonah lights up the bottles and tosses over towards the hay. 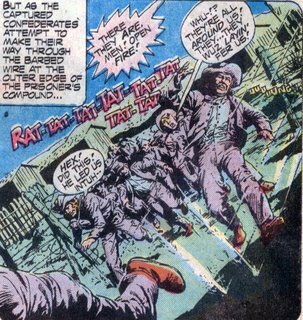 Dave shoots the bottles, setting the hay bale on fire and Jonah guns down the men as they flee for safety. Dave and Jonah return to the house where the fire has been put out. Jonah helps Sandy clears the table and Sandy tells Jonah that Dave has tuberculosis and won't last the year. Dave is worried how She and Tommy will make due since being a small-town sheriff, Dave doesn’t earn much money. She tells Jonah that Dave has cooked up a wild scheme that will make lots of money by.... Dave loudly interrupts her and asks Jonah if he would like to go on nightly patrol with him. 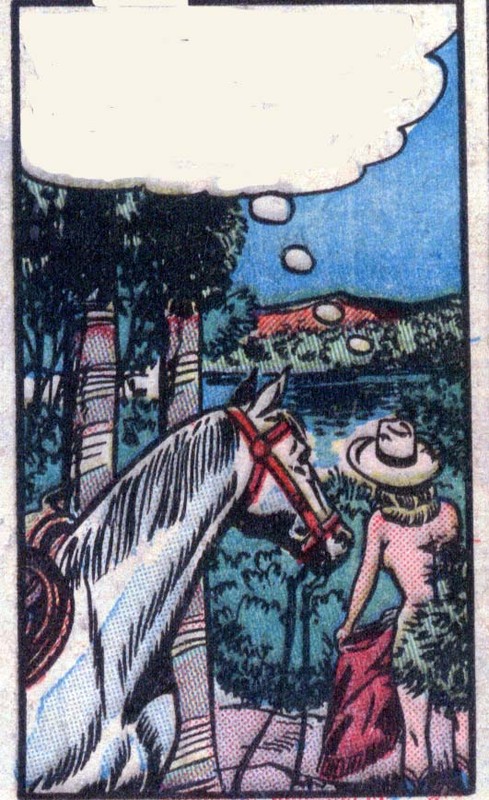 As they ride into town, Dave asks Jonah what Sandy told him. Jonah said it was about some plan to make money and asks if Dave is planning on stealing anything. He simply replies, "Nope". 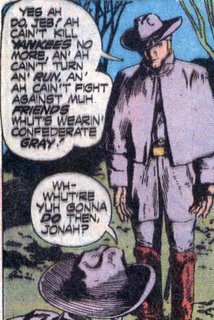 In town they encounter a local drunk, who takes note of Jonah's confederate coat and explains to Jonah what trash the Rebs were. Jonah sates that the war has been over a long time, but the drunk keeps railing. Finally the man charges Jonah who simply sidesteps and slaps him on the back of the head as he falls past into a horse trough. Dave fishes the drunk out and takes him to Jail. 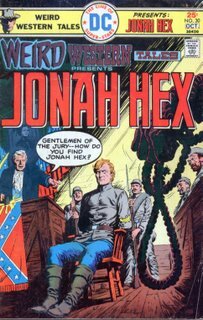 Jonah is waiting for Dave to return and a blind man in a Union uniform comes up and asks Jonah if he has his ticket to the gunfight yet, only $5. 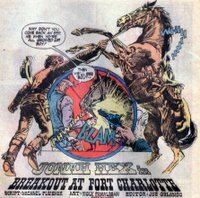 The blind man explains that it's a fight to the death between Sheriff Prentice and Jonah Hex, the two fastest guns in the west. It won't be fixed, neither, because Prentice guarantees that unless one of them dies, all the money will be refunded. The blind man, tired of trying to sell the ticket, finally wanders off. Dave returns and Jonah mentions how insulted he is that he wasn’t properly invited to the gunfight. Dave starts to explain and Jonah is suddenly knocked unconscious from behind. Dave tells Jonah's attacker to help get Jonah over to the arena. Later, Jonah staggers to his feet in the arena. It is crowded with the entire town and lit by kerosene lanterns and the first hint of sunrise is on the horizon. Dave is standing in the arena, facing Jonah. He apologizes for having to do this, but he's sold two thousand tickets at $5 each and he knew Jonah would never agree to do this. This is his only way of providing for his family and even if he loses the fight, he still wins. Jonah picks up his hat and turns to walk away, The crowd gets restless and starts booing. Dave warns Jonah that he'll shoot him in the back if he has to. Dave draws and we hear a shot ring out. Jonah spins around and Dave is dead. Sandy is standing to the side with a smoking rifle. She says that she couldn't let him become a murderer for her sake and then she falls to the ground, cradling her dead husband in her arms. Jonah leaves the arena and the banker approaches Jonah with the ticket receipts. Jonah says that he'll take them out to Dave's place as he leaves town. 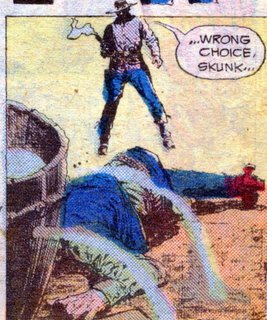 Just then Butch McCandless arrives and forces Jonah to drop his gun belt. 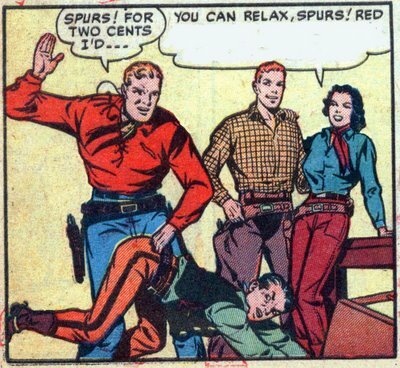 Butch is a little peeved about all the killing of his gang & will take the money to console himself. Jonah, with his guns on the ground and Butch holding two pistols on him, tells Butch that if he lets Jonah take the money to Prentice's family, Jonah will let Butch leave alive. Butch breaks out laughing until a knife is hurled into his chest. Jonah, standing over Butch's corpse, take the strongbox from the banker. Out at Dave's place, Jonah gives the money to Sandy and Tommy. Tommy, crying, asks if Jonah outdrew his dad. Jonah states that no man alive coulda outdrawn his paw, he was the fastest. This was a very enjoyable story. 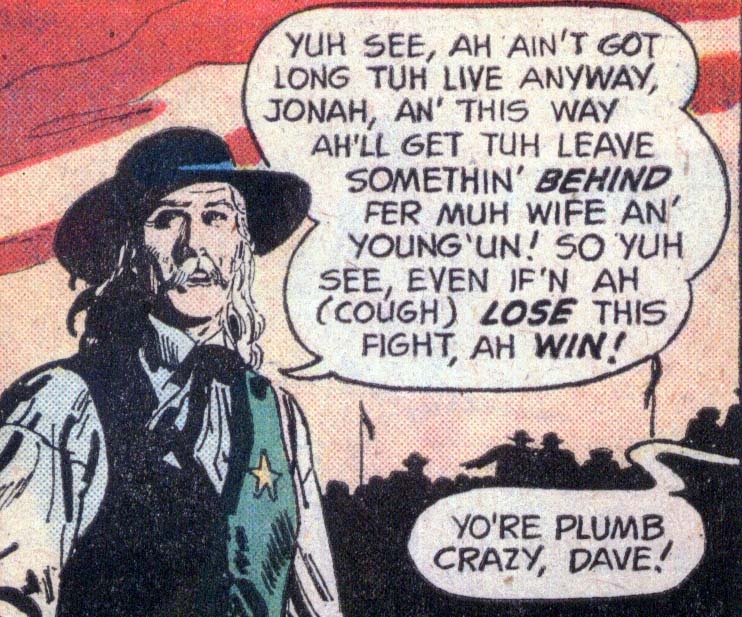 The interaction between Dave and Jonah sounded like two friends that hadn't seen each other in a long while, short questions, short answers, that fit these two men to a T. The little jabs and comments during the gunfights were priceless as well. Other nice bits included Jonah helping with the dishes and the blind ticket salesman. Finally, the irony of Sandy shooting her own husband to save Jonah was well done also. The death of Butch was the icing on the cake. 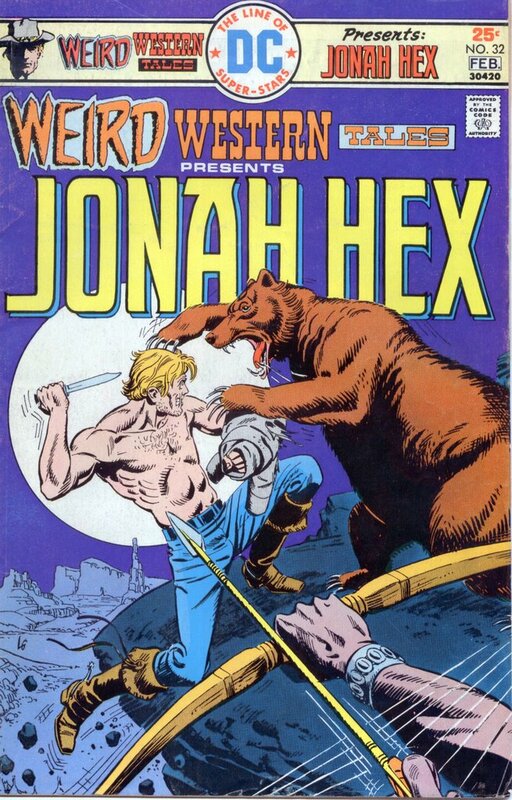 And since Jonah DID have to face the possible wrath of the entire town, this issue did include Jonah vs Wolverine ... Wyoming. Next Week: A kidnapping, Jonah fights a b'ar, and (I kid you not) Jonah Hex vs Bigfoot. No, really, Bigfoot. 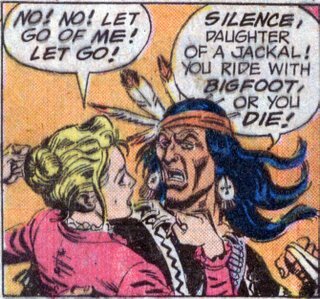 I'll be out of town on business next week, so Weird Western #31 & #32 will be posted on Oct 31 and Pitchman-A-Go-Go & Weekly Wonderous Moment in Comics will return in November. Have fun and don't start any memes without me. "Relax, Spurs. If you clench up, it hurts a lot more." But also in this issue was a story with Two-Gun Lil, so we have something for everyone. Guess I'm ready to hand those 'jaspers' over to the 'marshall'. And because I'm so giving, I give these to you to play with. Having been branded as a young buck, Brandon, besides never leaving the stable, is somewhat confused on issues of love. 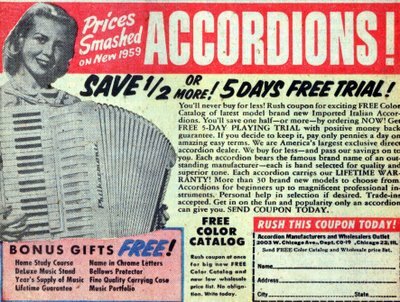 Continuing our ongoing non-series regarding girl oriented ads in comics, we present the accordian that comes with a lifetime supply of music. Followed by a loud BANG!!! This should put an end to the silliness. Here ya go Chris, don't say I never got ya nuthin'. 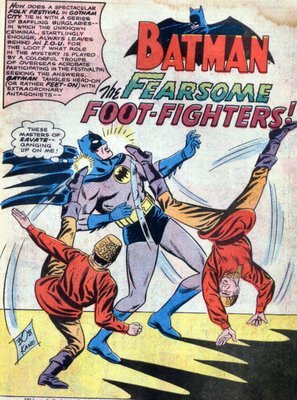 Batman getting two kicks to the head. 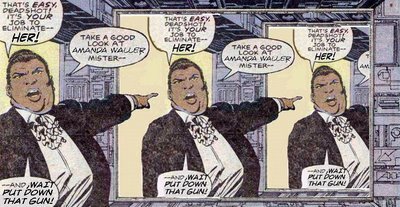 Amanda Waller is a force of nature, which one hasn't been discovered, but she is a force of nature. When she briefs you, you listen, otherwise you will suffer. and no one wants to suffer at the teeth of KnifeBiter!!!!! Batman trying to kill everyone on the plane to save the mob boss. and, of course, Bob Haney. What more can you say? Oh, yeah. You might be able to say this as the Monarch of the Ocean rides off. YEAH, BABEEE, HE'S BEAUTIFUL... IN HIS OWN WAY!!! 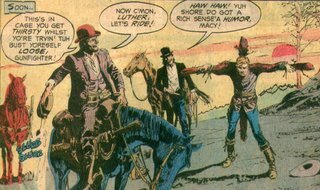 The Kents (1997-98, John Ostrander - writer, Tim Truman & Tom Mandrake - art) was a twelve issue miniseries that told the story of the Kent family in Kansas during the 1800's. The setup is that Jonathon Kent finds a trunk of letters & journals buried in his backyard in Smallville, Kansas. During the twelve issues he compiles the writings and sends copies of them to Clark, in Metropolis. The story starts in 1854 and ends up 40 years later in 1894. During that time we are introduced to the bloody history of slavery in Kansas, the fight to create Kansas as either a free or a slave state, the Civil War, the relocation of various Indian tribes to Oklahoma, and the rise of the outlaws in Missouri. This is quite an undertaking, following the Kent family through Kansas, Nebraska, Missouri, Oklahoma territory, and Texas. Does it work? On one level, yes, but it does fail on another. 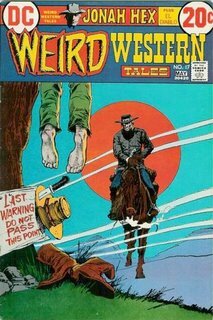 In the introduction, Ostrander writes that he was wanting to write an epic western but he had to pitch it to DC in such a way that they would buy it. 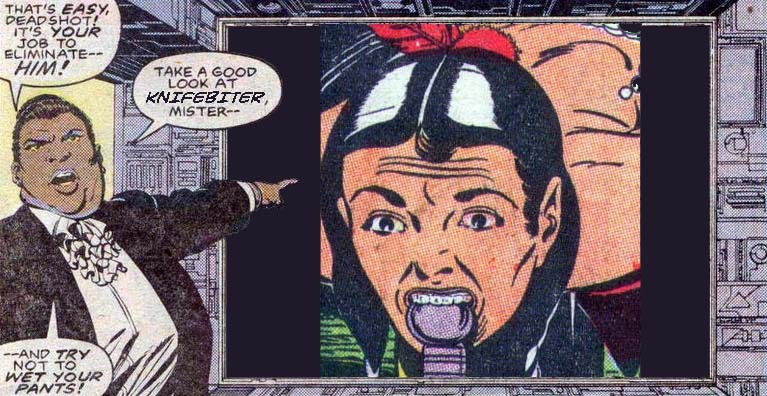 To do that he had to tie it into the DC Universe and that is where the story suffers. As a story about family writings found after many decades, this is an engrossing story. The family is woven into actual historical events and Ostrander has a good understanding of the political & social ramifications of historical events. 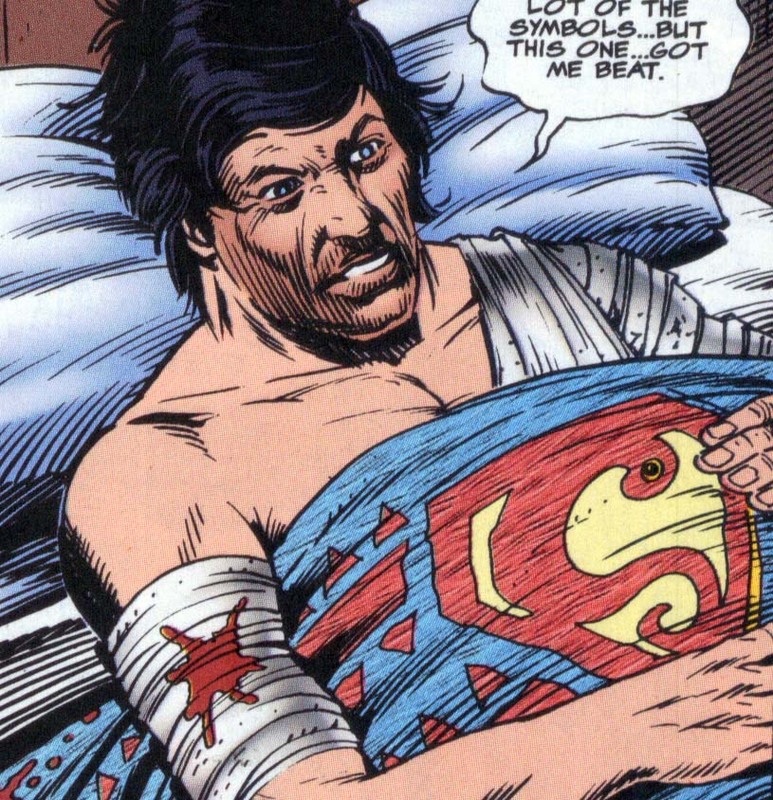 I never thought about Clark, the recipient of the letters, as being Superman. This kept the story grounded in reality. In issue #4 the story starts falling apart, well, not FALLING apart, but the first chink is knocked out of the mortar. 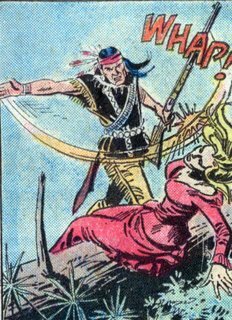 Nathanial Kent is wounded & his half-breed friend takes care of him & wraps him in an Indian healing blanket. Yup, a blanket with a big snake on it, I mean, a big S on it. 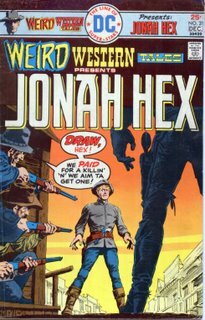 But then in issue #8, during 1864 Bill Hickok is relating a story that involves Jonah Hex. the problem? Jonah is sporting a huge scar. We know that Jonah surrendered to Union forces in1863 so why would have shown up back on the side of the Confederacy? Well, (you say) maybe the story took place before he surrendered? Nope, we saw when he surrendered and he wasn't scarred then. We also know that Jonah was scarred in1866. Sure, Tim Truman may not be expected to research how a character looked at a particular time in history (cough), but I would have expected the Editor, Peter Tomasi, to at least check this out. This is the 'dumping ground' that I warned about. 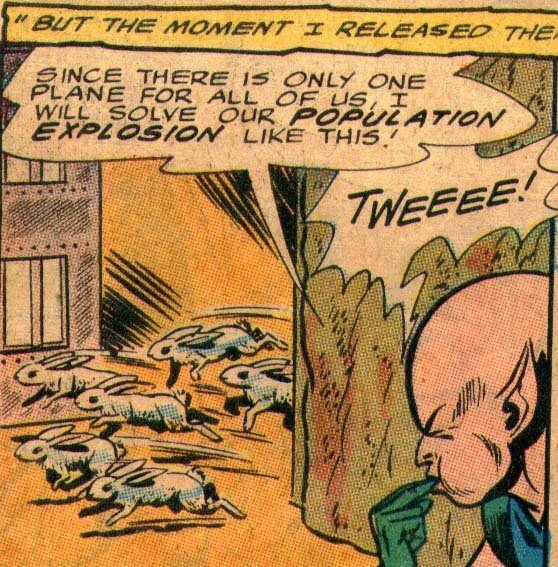 Lazy writers/artists/editors make dumb mistakes when trying to tie things in to the DCU without doing their homework. Later on, the Kents run into Scalphunter as well as Matt Savage. This jars me back into the 'comic book' world and pretty much ruins the 'willing suspension of disbelief' that makes the story work. Then they drive the last nail into the coffin on the last page when we see Clark Kent, who we know is Superman, pondering that the Kents have finally 'reached the stars'. 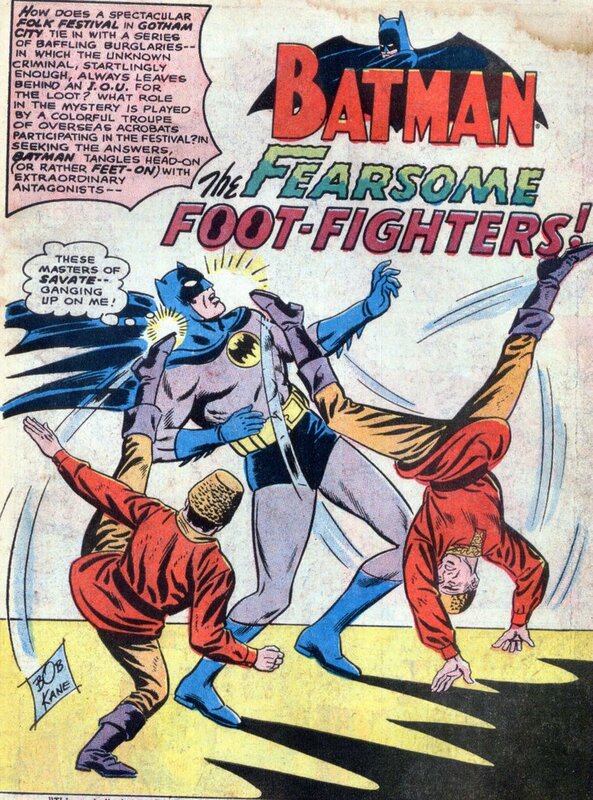 It's sad that DC wouldn't have considered doing this mini-series without trying to cram the DC Universe into it (or vice versa). 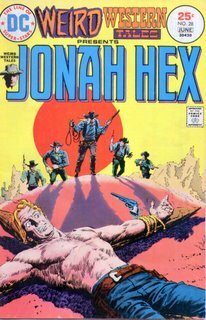 It's a good historical epic, just like Ostrander wanted, but cutesy meet-ups and tie-ins really undermine the effort. Could this have sold without the Kent/Superman hook? Probably not, and I think the comics industry is a little worse off because of that fact. Here is another one for the ladies, & I do mean Ladies. 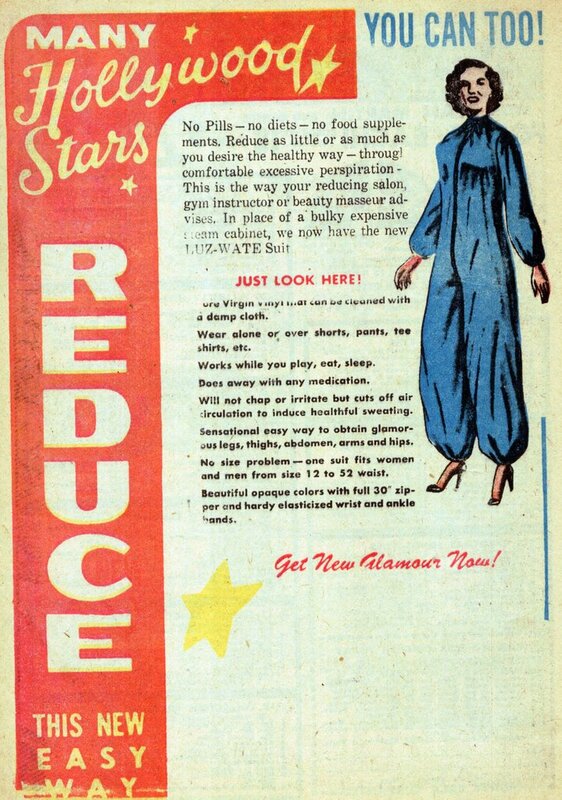 Yup, you lovely ladies can reduce just by sweating! 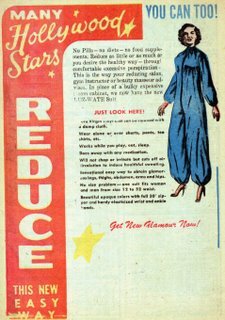 While wearing Liefeld pumps to boot! 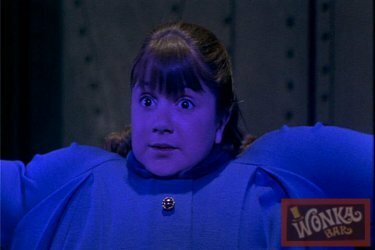 But for some reason I keep thinking about Violet Beauregarde. I also keep wondering why this ad was in Indian Warriors? It's October and you know what that means...CHRISTMAS LISTS!!! 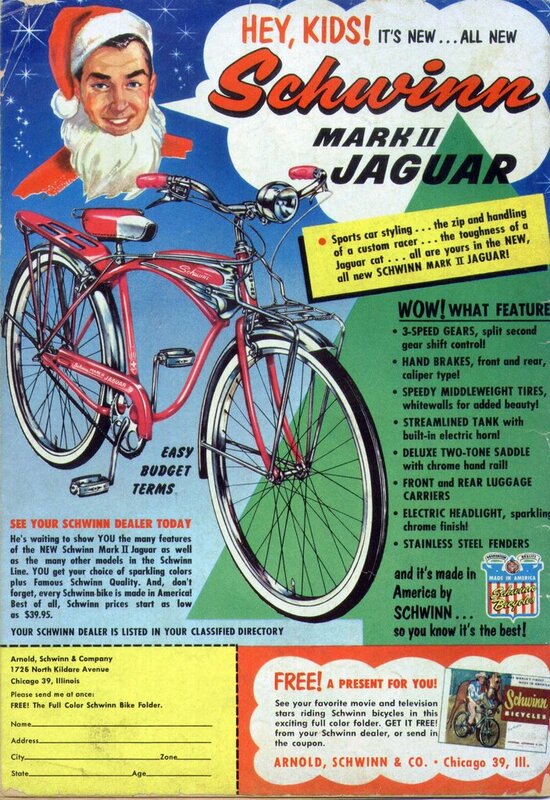 So put this one on your list NOW & be the first on your block to cruise the street on this beautiful 1957 Schwinn. 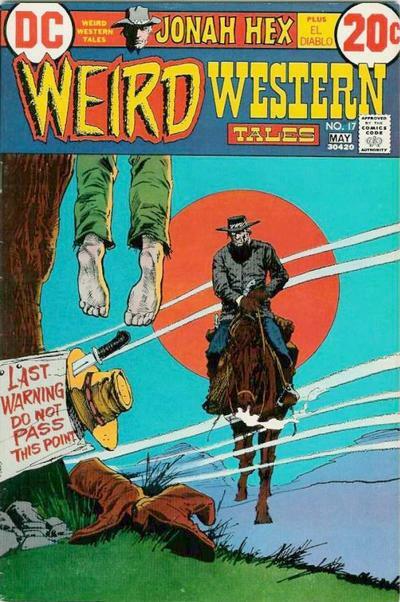 Weird Western Tales #28 "Stagecoach to Oblivion"
Michael Fleisher, story - George Moliterni, art. The story starts in Green Rapids, Wyoming, 1874. A telegraph operator receives an important telegram. He rushes out to deliver it when he hears gunshots. 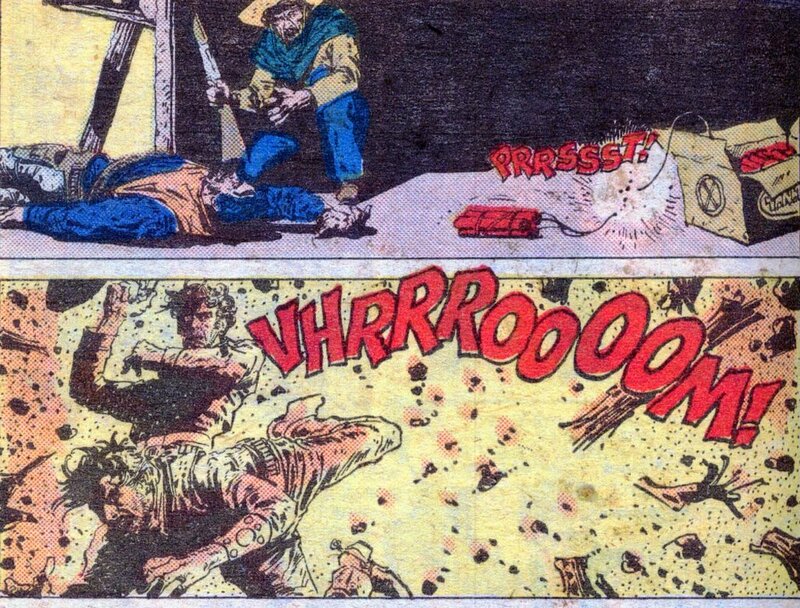 In the street is a dead man and Jonah Hex reloading his pistol. 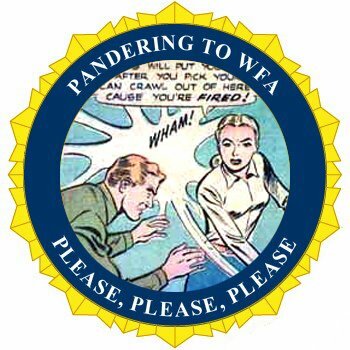 The telegram is a job offer for Jonah from the Huddleston Downing Express Company, over in South Pass City. Four days later, Jonah arrives in South Pass City just as the stage arrives with one of the drivers shot up by the Hauschel Gang. 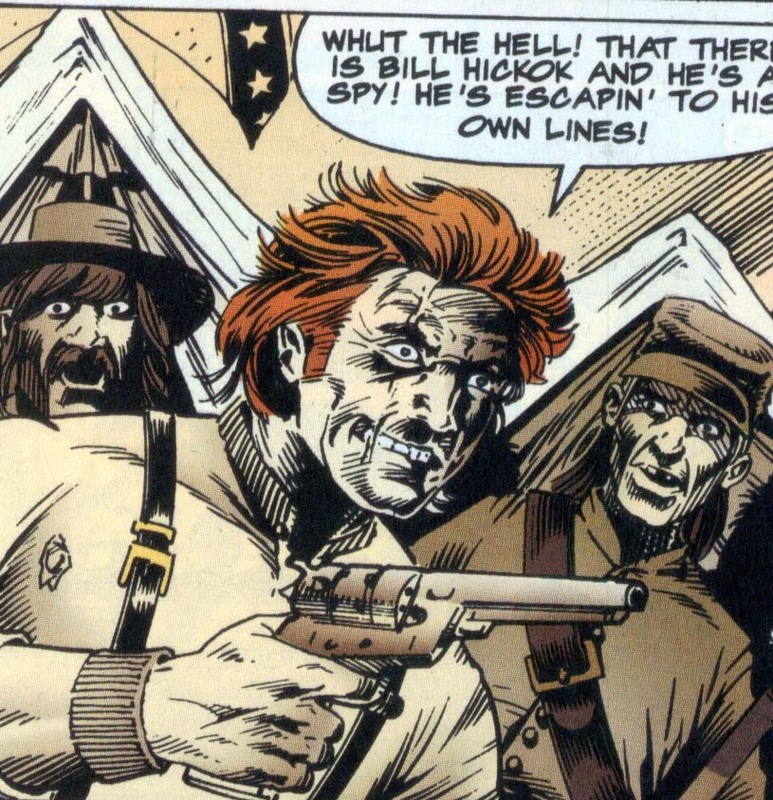 Jonah locates Mr. Preston, the man who sent the telegram. Preston explains that Huddleston Downing ships gold nuggets from the local mine over to Green River City but Jake Hauschel & his gang are constantly robbing the stage. Tomorrow they are shipping $135,000 by a secret route that only Preston and his clerk Sims is aware of. Preston shows Jonah that he has had the coach reinforced with steel plating and demands that Jonah ride inside instead of alongside. Jonah takes the job. 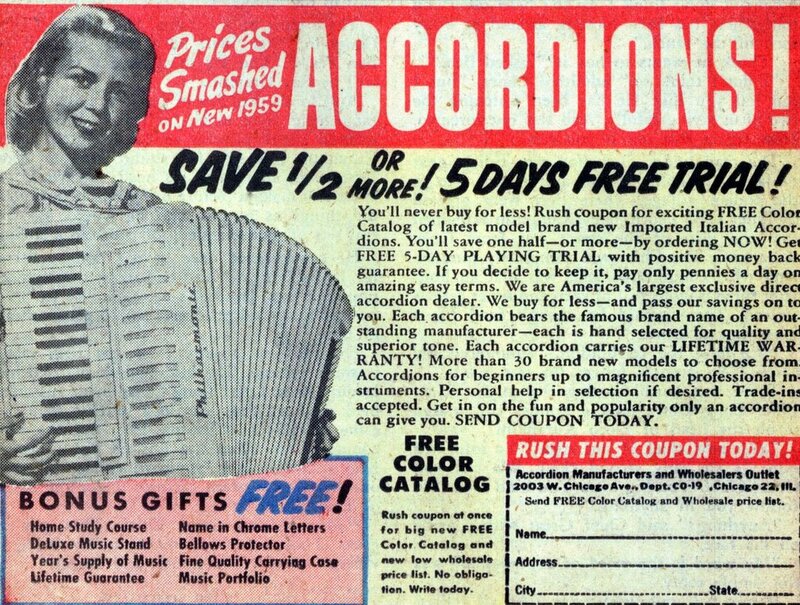 That night, Sims, the clerk, shows up at the Hauschel hideout and delivers all the info on the shipment, route, guards, eveything, in exchange for 25%. As he turns to leave, Jake Hauschel shoots Sims in the back. The next morning, Jonah is telling Preston that he hopes they don't regret letting Jonah see the route in advance. That proves to b true as the stagecoach comes up on "The Narrows", a half-mile stretch of road with cliffs towering over it on both sides. The pass is so narrow that the stage couldn't turn around if it had to. Just as the stage gets to the middle, the Haschel Gang starts firing from above, killing both drivers and all six horses. Jonah and the men are pinned down in the stage. The other guards ar convinced they're safe because someone will come along and then go get help. Jonah decides to make a break for it. As he runs for shelter, Jonah is cut down in a barrage of gunfire. The Hauschel Gang then sends flaming kegs of kerosene down onto the stage, setting it afire. As the guards run out, they are shot dead in their tracks. After the stage burns out, Jake and the boys gather the chest and ride off. 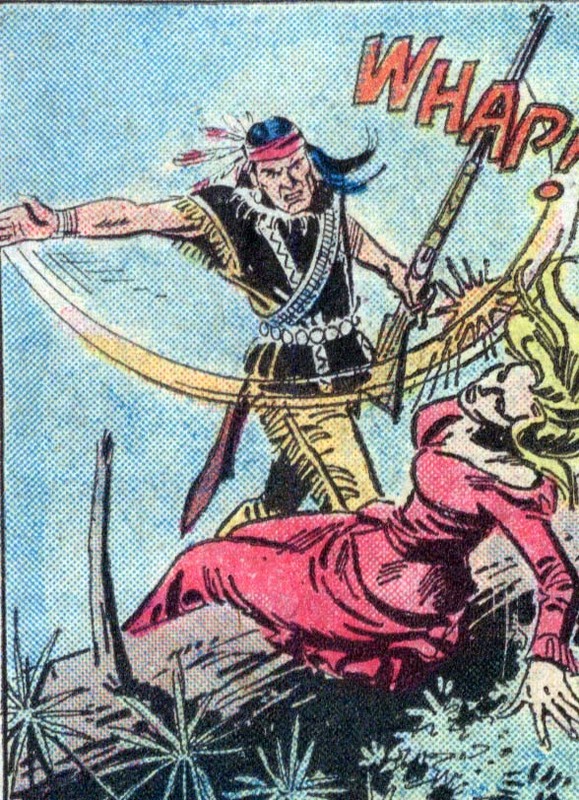 Several hours later, Jonah stirs and realizes that he luckily had a bullet only craze his scalp. Manyhours later, Jonah arrives back in town on foot. As the doc is tending Jonah, Preston storms in, demanding to know what happened. Jonah mentions how the Gang knew the route. Preston mentions that Sims is missing. Jonah asks whose idea the "Narrows" was and Preston owns up to it, saying that it was the shortest & cheapest route. Jonah bad-mouths Preston and then leaves. 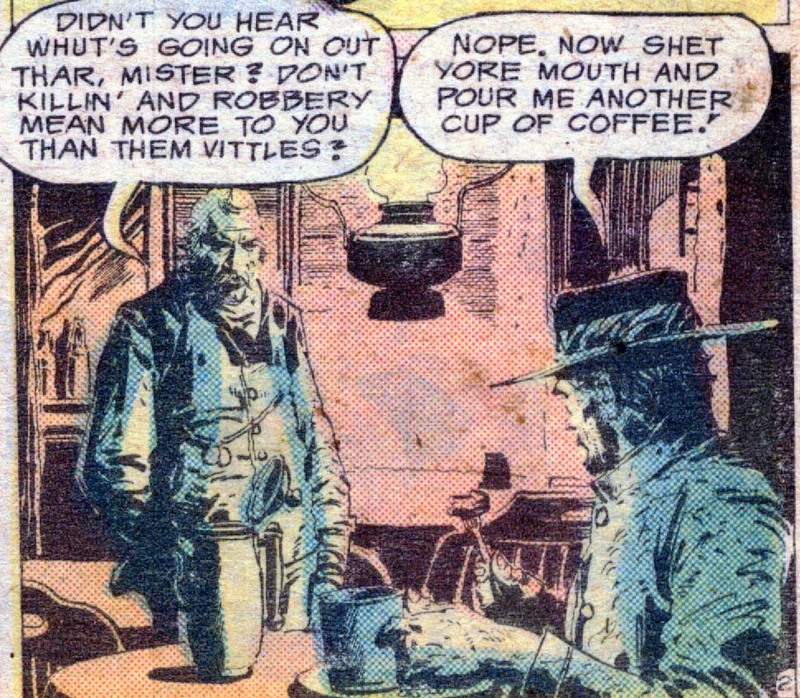 The next morning, Jonah is having breakfast at the saloon and he is approached by Cobb Wisner. Cobb's cousin is a member of the Hauschel Gang. Cobb tells Jonah tht he has heard the gang has almost a half million stashed away. Cobb says that he could tell Jonah where the hideout is and Jonah could kill them all and find the money. Jonah turns down Cobb's offer, saying that he doesn't want their blood money. Jonah heads out on his own to track down the Hauschel Gang. As he starts closing in on them, he gets ambushed by two members of the gang who decide to "fix 'im up jus' lahk we done thet preacher ovuh in Tucson last year" and they tie Jonah to a cross made of saplings. They empty Jonah's canteen and leave him for dead. Jonah eventually finds a narrow canyon archway and keeps slamming the ends of the crosspiece until it finally cracks but Jonah collapses from exhaustion. That night, at the Hauschel hideout, Jake wakes up in the middle of the night and stabs his own lookout, returns to the cabin and shoots the remaining four members of his own gang. In the gunfight, Matt Borden (the cousin of Cobb Wisner), gets off a lucky shot and kills Jake. Wounded, Matt heads for town on horseback. Jonah comes to and continues on to the hideout, only to find everybody dead and a trail of blood leading back to town. Meanwhile, in town, Matt comes riding in, shouting for help. Several townsfolk rush to his aid and start to take Matt to the doc's office. Just then Cobb shows up and demands that Matt tell them where the loot is hidden before they get him treatment. An arguement ensues and then Jonah comes riding up. Jonah comments that Cobb is pretty free with money that isn't his and then rides off to get a steak. 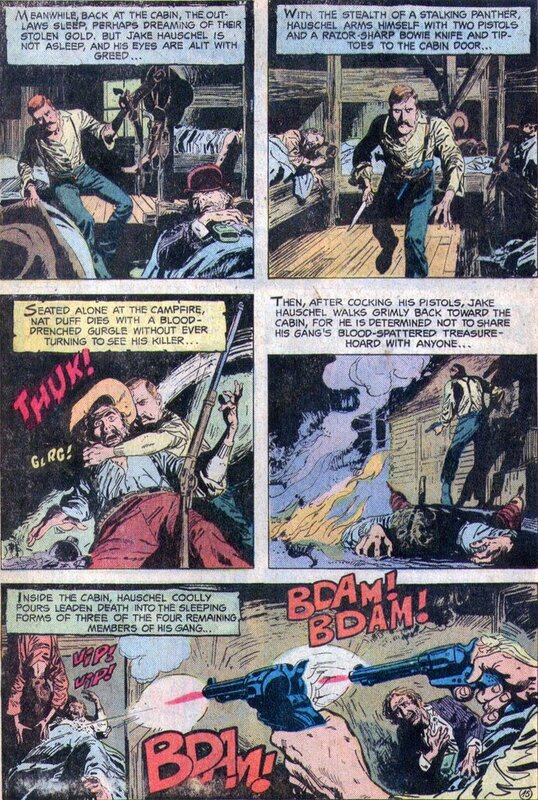 The townsfolks side with Cobb and refuse to let the Doc treat Matt until he reveals where the loot is hidden, but Matt then up & dies. 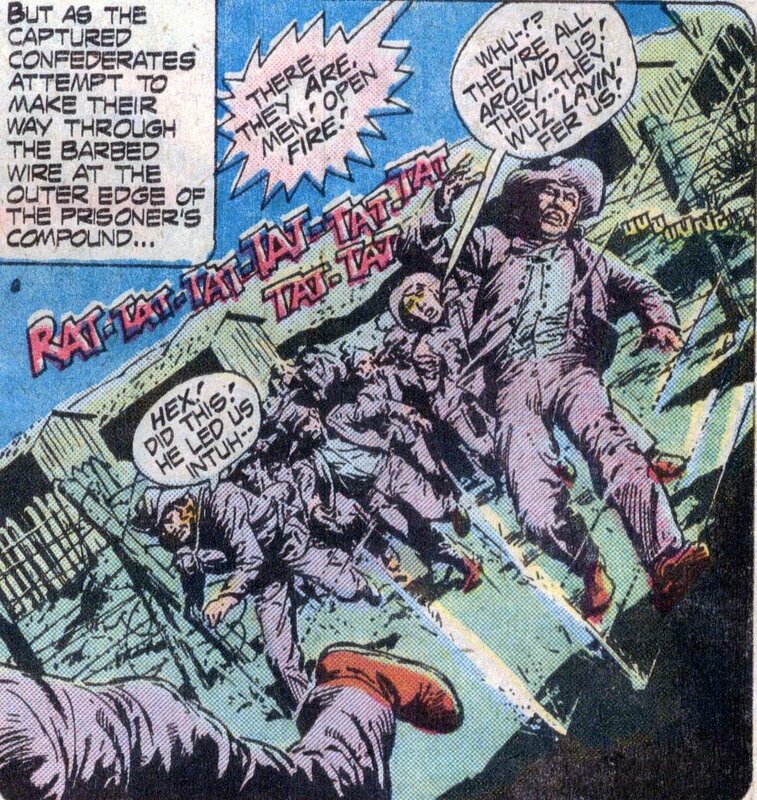 The townspeople get angry at Cobb for dragging things out and losing their share of the treasure. They grab a rope and hang Cobb in the middle of town. A man comes running into the saloon where Jonah is eating and shouts out they are gonna hang Cobb. Everyone excitedly rushes out to watch the hanging, leaving Jonah alone, eating his steak. Timeline - 1874, stated clearly at the beginning. A blurb at the end of the story explains that this story was true and the Hauschel gang's loot has never been found. I learned that South Pass City is real, but I couldn't locate any info on the Hauschel gang or a company called Huddleston Downing Express. I didn't care for this issue very much, it was nice to see Jonah tied to real events, but has been done since and has been done better. 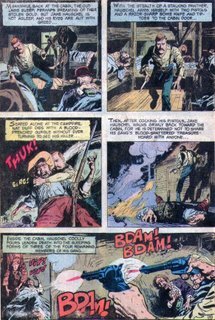 At times the story almost seemed like one of the old westerns that Gold Key put out, with tons of text on the page (like when Jake kills his gang). George Moliterni's art is very good, lifelike and gritty with people having natural proportions and their clothes hanging like real cloth. 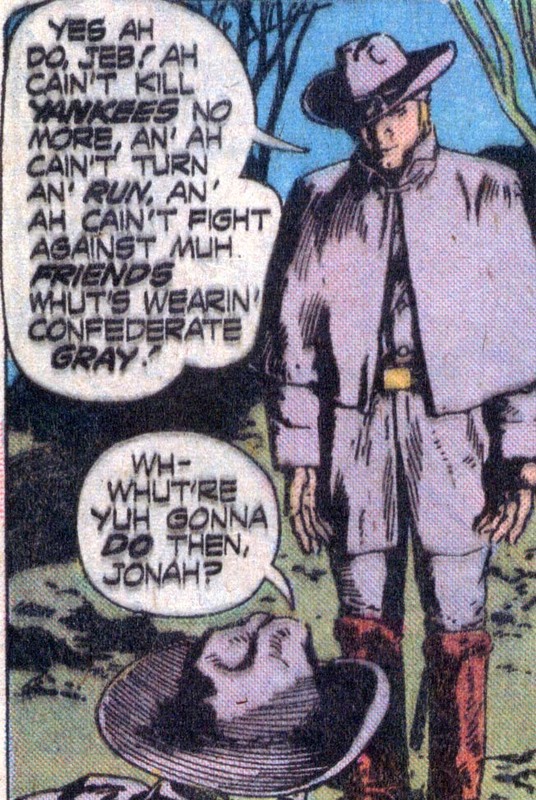 George did a lot of work on Jonah and I always thought he was under-appreciated. Next Week: Prison Break!! 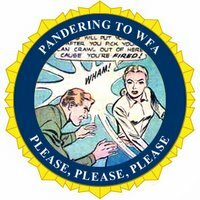 The truth about the Man with the Eagle-topped cane!! And the Emancipation Proclamation!! Palmiotti and Gray - DORKS!!! UPDATED!!!!! Tying Jonah directly to the Dents and actually being an ancestor to one of the more famous villains is just a little too much to me. I can swallow the chance encounters, they really don’t alter either characters involved. So the Kents run into Jonah. Neither are worse for the wear. 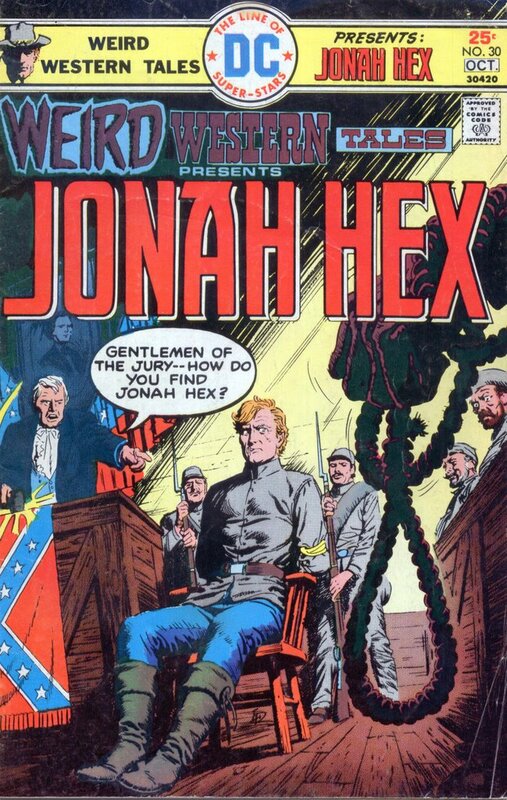 I can even take the slight reference to St. Roch in a recent Jonah Hex, but I think if do the Hex/Dent storyline a line may be crossed that will allow writers to take almost anything that happened in the 1870s and try to tie it to Jonah in an attempt to be clever. 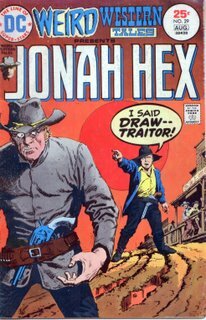 And then Jonah’s character will become a dumping ground for anything in “The Old West”. I don’t like it. Well, I warned you folks & what really hacks me off, is that this 'dumping ground' moment was brought to us by the current writers of Jonah Hex. Thanks Palmiotti and Gray, thanks for trying to be cute and totally dorking up a Jonah Hex cameo. That is an art error by Daniel Acuna. Jonah was supposed to be leading them BACK to Canyon DeChelly in 1868 not TO the reservation as depicted in the page layouts. I was very careful to make sure the timeline worked and we wanted to present Jonah was a friend to the Navajo, unfortunately production wise that didn't happen. This isn't the first time that there has been an art error in a book and of course Jonah Hex #2 had an entire page flipped. 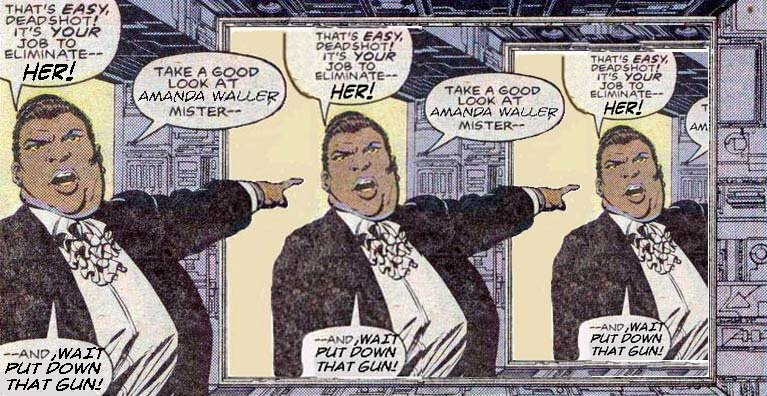 Guess I should say that all is forgiven, even though I would like to see some sort of official correction, but how does one do that in a comic? Yup, I missed #10 about three weeks ago. 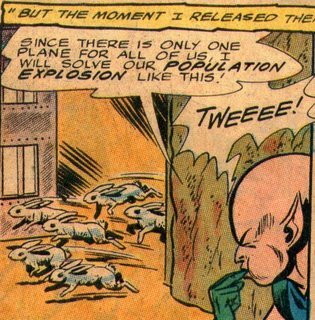 I've always had trouble counting in base 10, probably because I have 12 fingers. hee hee. Well, we've all marveled at various forms of gorillas both here and abroad, but I would like to put forth that there is an animal that is even more dangerous than any form of gorilla. I present....the fluffy bunny. Wait, I mean the UNDEAD fluffy bunny. Multi-Man has obviously been breeding this little darling for about..(Let's see, 1, 2, 3, 4, 5, 6, UNDEAD fluffy bunnies) 3 minutes. How effective IS the UNDEAD fluffy bunny? See for yourself. 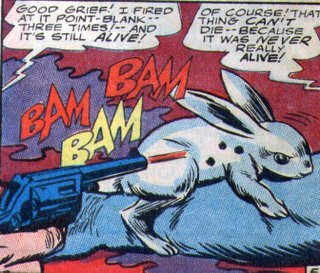 No matter where the UNDEAD fluffy bunny latches on to you, your ENTIRE BODY TURNS BLUE!!!! Let's see one of your damn apes do THAT!